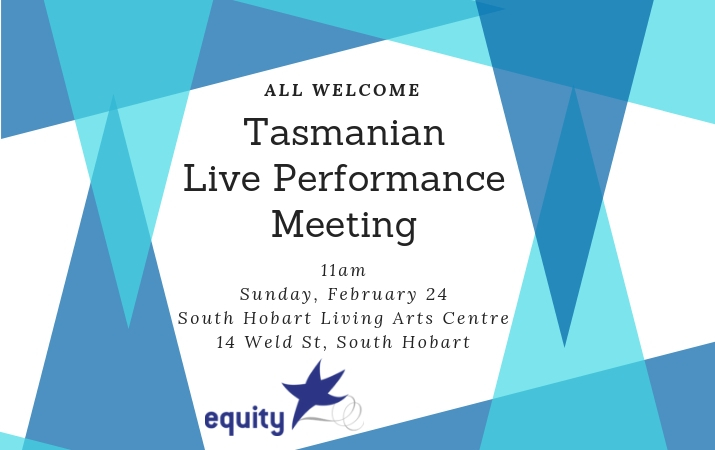 Mass meeting for actors, dancers and performers working in independent and commercial stage productions in Tasmania. You do not need to be a union member to participate in this meeting. This meeting aims to discuss and plan how we work together to ensure and maintain high standards of physical and psychological safety when professional actors are working in non-commercial or not for profit productions. • General Equity updates and information: Federal election, Screen TV and Film campaigns etc. Please RSVP so we can estimate numbers. To inform part one of the agenda please take part in this survey to share (anonymously) your experiences in regards to bullying and harassment in live performance. For more information, contact Sarah McKenzie on 03 9691 7125.